AmaZulu general manager Lunga Sokhela says clubs should stop poaching his prolific striker, Emiliano Tade. The Argentina striker, who joined Usuthu on a two-year deal with a one-year option to renew from New Zealand side Auckland City, is rumoured to have caught the eye of Tshwane giants Mamelodi Sundowns. Tade has hit the ground running for the Durban-based side, scoring six goals in eight games in all competitions. 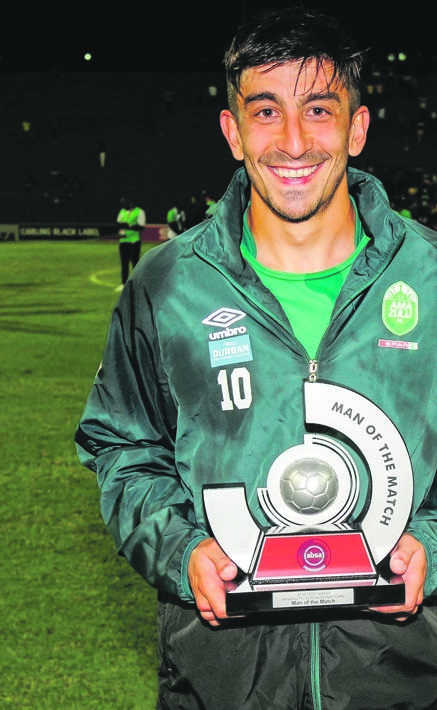 The 30-year-old was the game-changer for Usuthu in November and December when AmaZulu won three out of four matches to move out of the bottom of league table. For those efforts, he became the first player from Usuthu to win the Absa Premiership Player of the Month during that period along with his coach Cavin Johnson, who was named Coach of the Month. Sundowns coach Pitso Mosimane hinted last week that he likes one striker in KwaZuku-Natal, but didn’t reveal his name. But it was revealed that Sundowns may loan out Bongi Ntuli, on a season loan to AmaZulu, in a bid to snare the South American. “Clubs will come knocking, but he has a contract with AmaZulu. As I’m saying, we’re not here to add numbers to the league,’’ Sokhela insisted. Sokhela emphasised that selling Tade could anger their sponsors who want trophies for their investment. “The thing is, the sponsors that we have told me they want to associate themselves with a winning club, that is reality. “We won’t help ourselves if we start now offloading key players. “You do see what is happening at Maritzburg United, they released two key players (Lebohang Maboe to Sundowns and Bevan Fransman to Highlands Park) and went from last year being talk of the town, and now they’re struggling. “I mean, you take away Cristiano Ronaldo from Real Madrid and it becomes a different team altogether, so definitely not in our interest. Tade is the all-time leading scorer for Auckland City with 107 goals in 162 appearances. He won three golden boot awards with the club and helped them get a bronze medal at the FIFA Club World Cup in 2014.